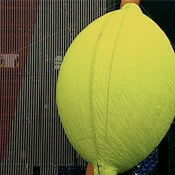 The DVD version of 'PopMart Live From Mexico City' - giant mirrorball lemon, cocktail stick plus Haring, Warhol and Lichtenstein - was released on September 10th 2007. Described as a 'sci-fi disco supermarket', the PopMart Tour opened in its 'spiritual home', Las Vegas, on 25th April 1997. 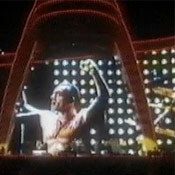 'PopMart Live from Mexico City' was filmed at the Foro Sol Autodromo in Mexico City in December that year and directed by David Mallet. Filmed on analogue video - and originally released on video in 1998 - for its DVD debut it was transferred to a digital format with re-graded pictures, remastered audio and mixed in 5.1 Surround Sound. 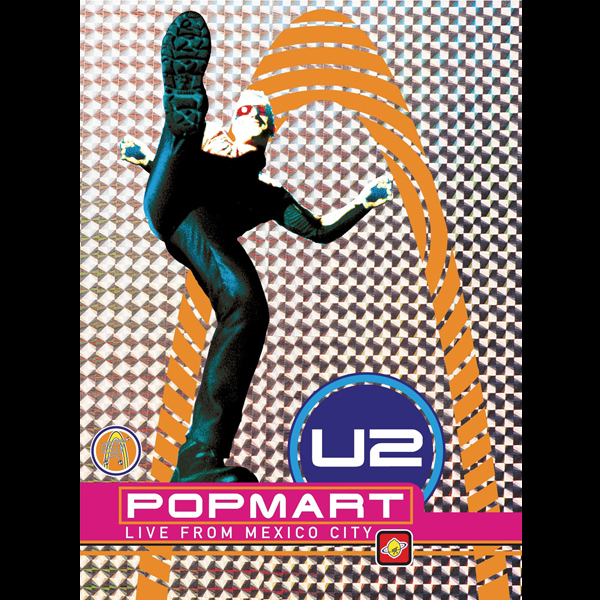 The DVD was released in a Standard 1-disc format, featuring the concert, and a Special Limited Edition 2-disc format, the second bonus disc containing unreleased live audio and video material, including documentaries, a PopMart tour visuals montage, and DVD-ROM extras. Disc One: Pop Muzik / Mofo / I Will Follow / Gone / Even Better Than The Real Thing / Last Night On Earth / Until The End of The World / New Year's Day / Pride (In The Name Of Love) / I Still Haven't Found What I'm Looking For / All I Want Is You / Desire / Staring At The Sun / Sunday Bloody Sunday / Bullet The Blue Sky / Please / Where The Streets Have No Name / Lemon (Perfecto Mix) / Discotheque / If You Wear That Velvet Dress / With Or Without You / Hold Me, Thrill Me, Kiss Me, Kill Me / Mysterious Ways / One / Wake Up Dead Man. 1. Bonus live tracks - Please / Where The Streets Have No Name / Discotheque / If You Wear That Velvet Dress All recorded live at Feyenoord Stadium, Rotterdam on 18th July 1997. - Hold Me, Thrill Me, Kiss Me, Kill Me / Mysterious Ways / One All recorded live at Commonwealth Stadium, Edmonton on 14th June 1997. Pop is an underrated album, and the Popmart tour gets overlooked as well. Just look at that set list! Last Night on Earth is just amazing live. It is so perfect for a large venue because it projects so well, I was really surprised it didn't appear on the 360 tour.